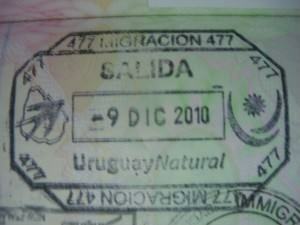 I met a bunch of travellers in South America who had gone from Buenos Aires in Argentina to Uruguay by boat. On my journey however, I did things the opposite way. 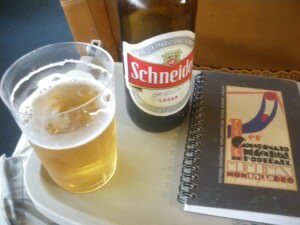 I left Montevideo on a quest to head straight to Puerto Iguazu, and I totally skipped staying any longer in Buenos Aires (except a brisk walk from the ferry to the bus!). 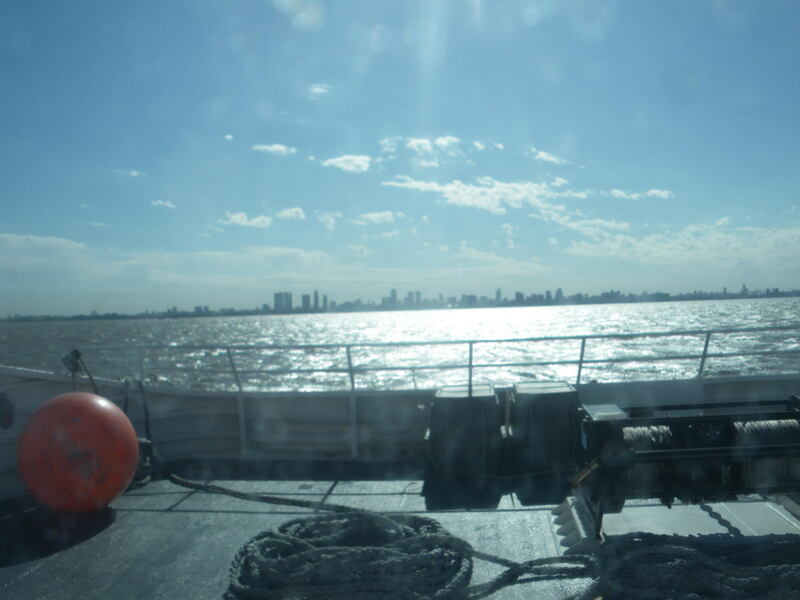 Here’s an overview of my trip with some good tips for you on how to get from Uruguay to Argentina by boat – I only cover the travels I actually do, so for the land border you will have to check somewhere else. 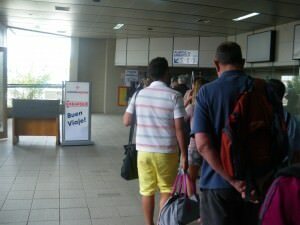 It’s simple – book the entire bus and ferry ticket at the same time at Tres Cruces Bus Station in Montevideo. 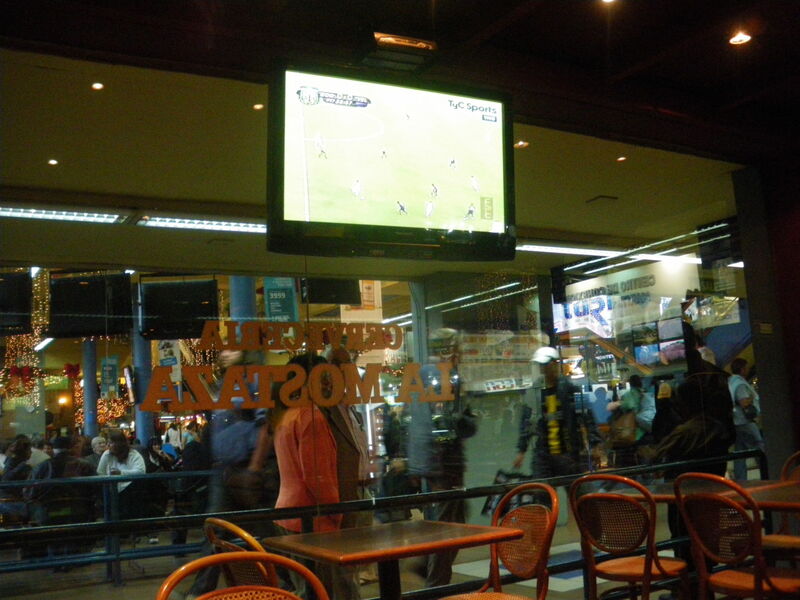 I loved this bus station – it has a bar, it’s close to the football stadium (Estadio Centenario) and it is relaxing. 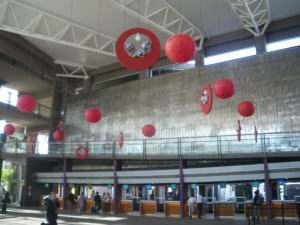 It also has a load of shops and it is EASY to book tickets in. Some South American bus stations can be dodgy and not comfortable at all (Cucuta and San Cristobal for a start). 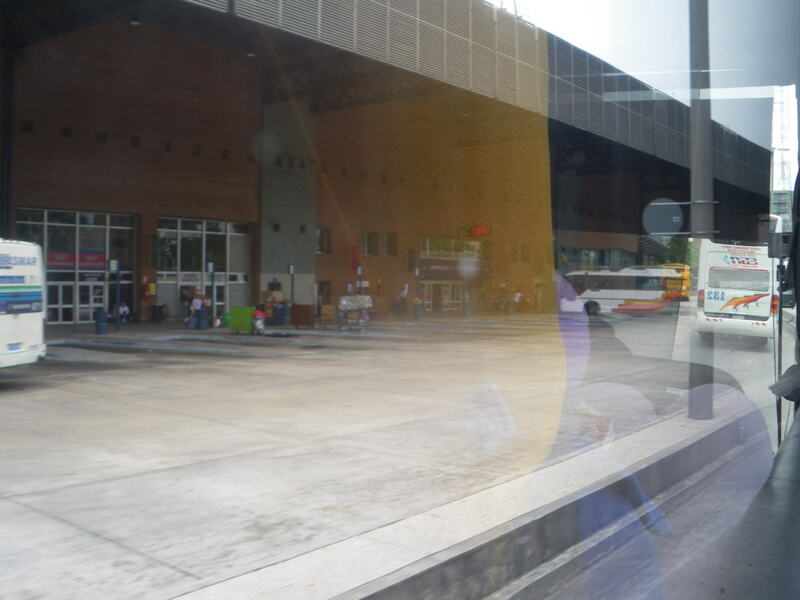 Head to Tres Cruces and go to the International buses section. 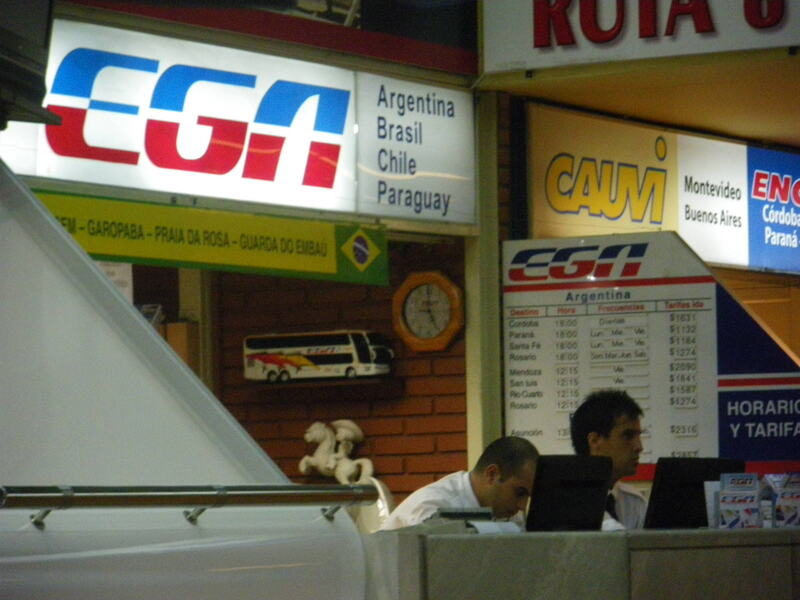 One of many bus booking counters for International Routes at Montevideo’s Tres Cruces Station. Ask around at the various counters for a quote to take you from Montevideo to Buenos Aires (via Colonia) then pick the cheapest or best option for you. I was on a mega tight budget so I simply picked the cheapest bus and ferry and the cheapest time of day. This meant leaving early afternoon, but I was loving it! Payment is by cash and in Uruguayan Pesos only. 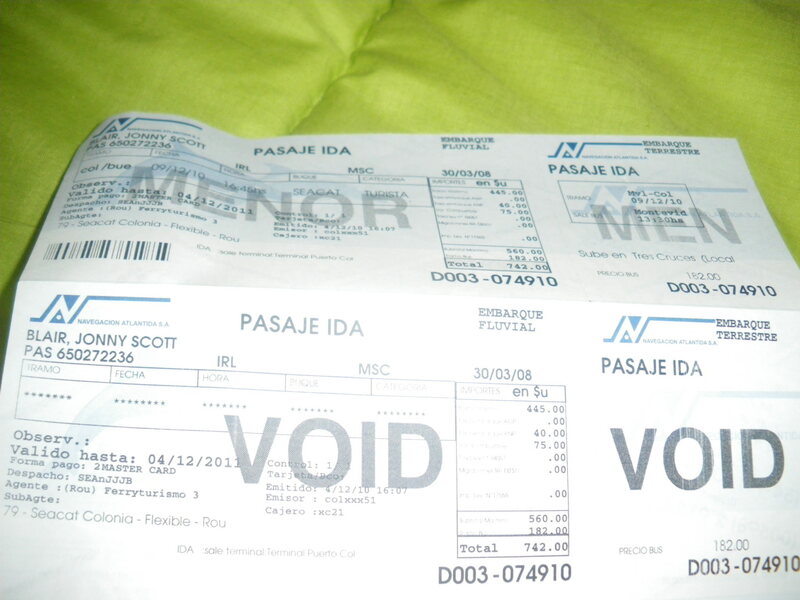 I used the company Ferrylineas. Please note that you will need your passport to make the booking so don’t forget it and also it must be paid in cash in Uruguayan Pesos only. My view from one of the bars at Tres Cruces bus station in Montevideo, URUGUAY. 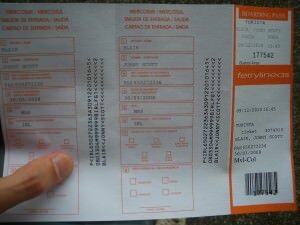 You will be issued with two tickets in an orange folder. 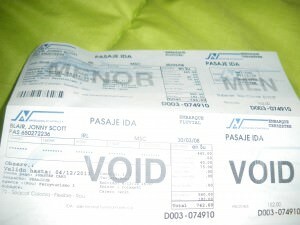 The first ticket is for the bus from Montevideo to Colonia del Sacramento. The second ticket is from Colonia del Sacramento to Buenos Aires by ferry. 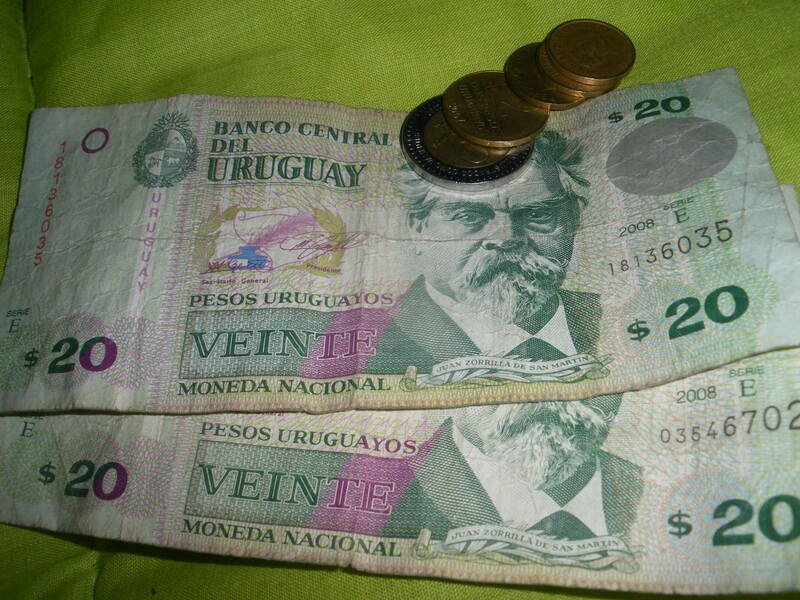 OK so I went in December 2010 so a long time ago, but at that time it was a total cost of 742 Uruguayan Pesos, that’s around $40 US. There was no food or drink included in this. 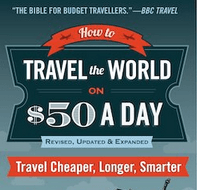 I heard of travellers getting the same trip for $30 US. Remember this is a ferry AND a bus so that works out at $20 US each. The bonus is that for British and Irish citizens there is no visa needed to pass through the two countries, and no charge to cross the border. Make sure you arrive at the Tres Cruces terminal about 30 minutes before your departure. This allows to to find the exact bus stand that your bus is leaving from and also get your ticket checked in. You will keep your luggage until going through the gate and being beside the bus. When you hand over your luggage to the guys, make sure you get a ticket for collecting your luggage – you will need it to get your bag in Colonia del Sacramento. 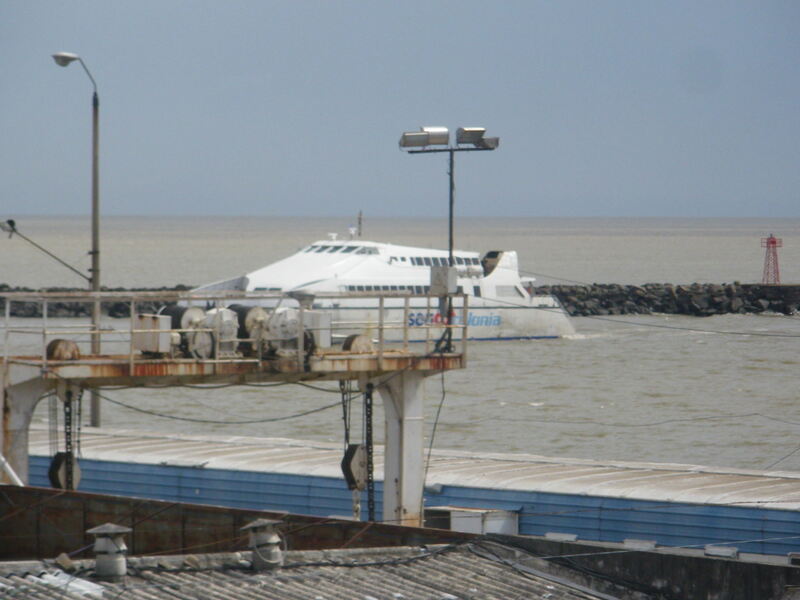 After and epic and relaxing two hour bus journey along the Uruguayan South Coast you will be dropped off at the ferry terminal. The first thing you need to do (after getting your bag) is go through immigration and leave Uruguay. This is a very straight forward and simple process, all done and dusted in a matter of minutes. Then you just wait in the terminal for your ferry. 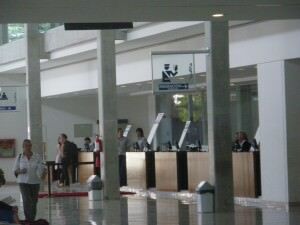 It’s a very modern terminal and there are snacks and drinks available there. 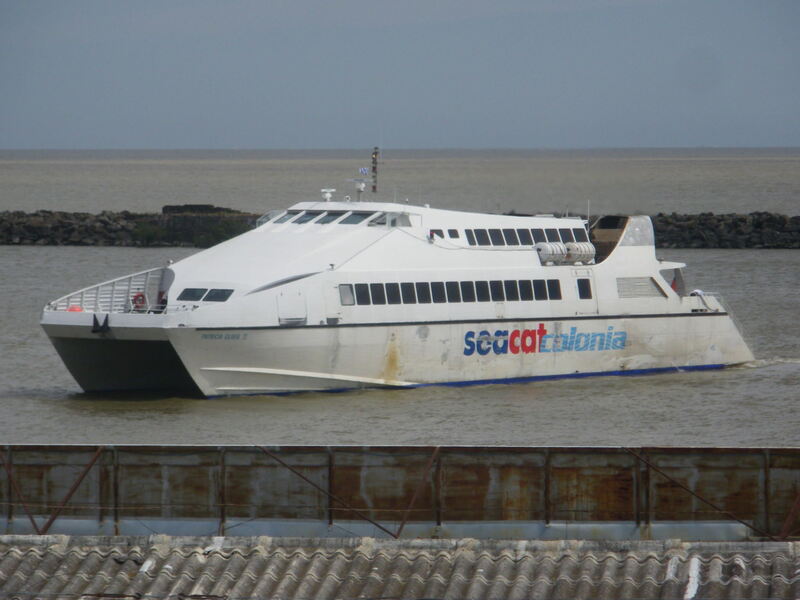 There are a few boat companies running this route to Buenos Aires, I was travelling with Seacat. I heard of others using Buquebus. It’s 6 of one and half a dozen of the other – I just picked the cheapest one! 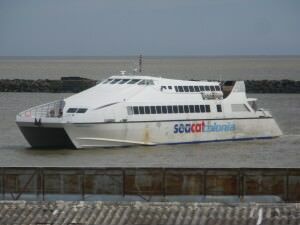 The Seacat ferry I got was a small, all seater catamaran, there are no vehicles on it. The ferry takes just over an hour and is a relaxing ride. I updated my travel notes, enjoyed the view and had a beer. 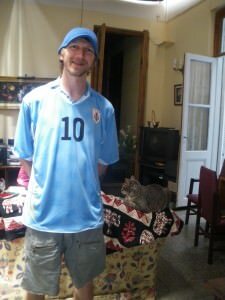 I will also admit to shedding a tear on this part of my journey as I loved Uruguay so much I was sad to leave, and I knew it would be a long time before I return there. Your ticket will have an exact seat number on it by the way so make sure you sit in the correct seat. The bar isn’t that expensive in fact. Also again, you will get a luggage tag for your bag, make sure you keep it. Enjoy the views as the colossal skyline of Buenos Aires arrives over the horizon. The final part of your journey is almost as simple as getting on the ferry. On arrival in Buenos Aires, you can admire the skyline and take your photos, then you will head to collect your bag (don’t forget your luggage tag) and do the immigration formalities. The Argentinian officials are among the strictest in South America and this can take a while. 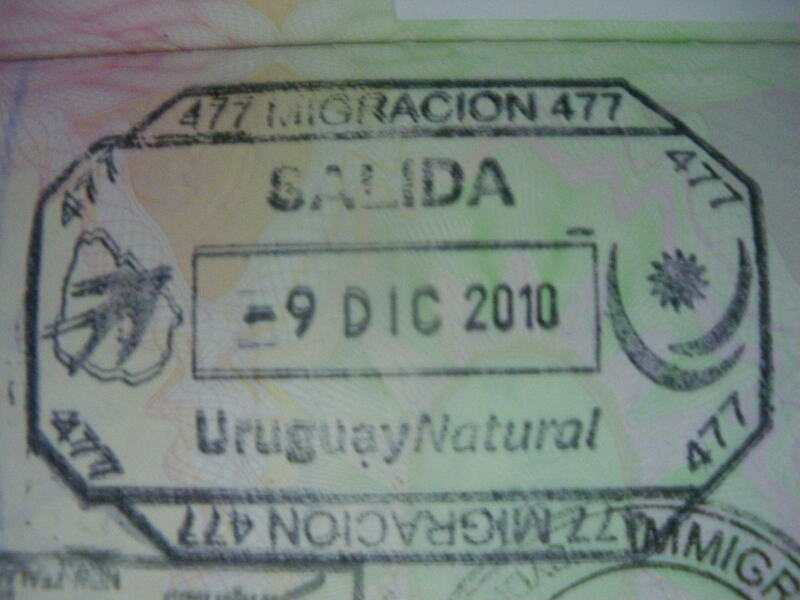 I passed through and out of Argentina 8 times in the end and found that using my British passport raises eyebrows (still bitter about the Falklands War) whereas my Irish one goes un-noticed and raises a smile. 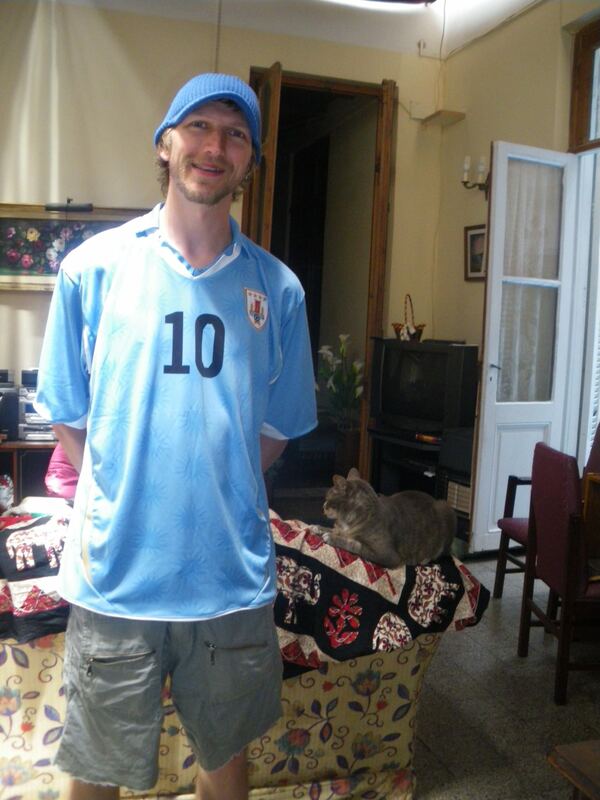 If you have dual nationality and one of them is British, use the other one for a faster entrance into Argentina. Where to head next from the ferry terminal in Buenos Aires, Argentina? 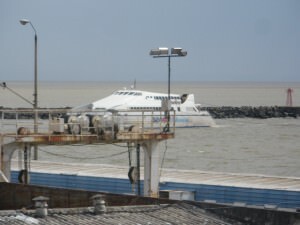 OK so you are now safely in Argentina and you are at the ferry terminal at the corner between Avenida Antartida Argentina and Avenida Alicia Moreau de Justo. If you’re heading to a hostel in Avenida Florida, then it’s easily walkable. 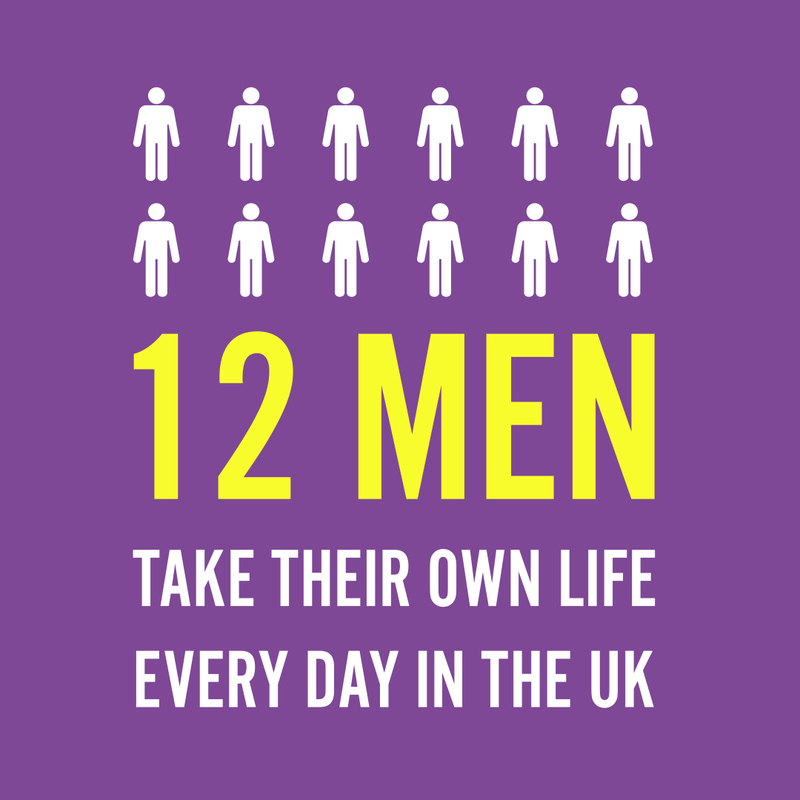 Taxi is also an option, but it’s a brisk walk. 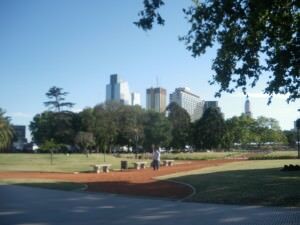 On arrival in Buenos Aires I walked in the sun along this street Avenida Antartida Argentina to the Retiro Bus Station for my onward journey. 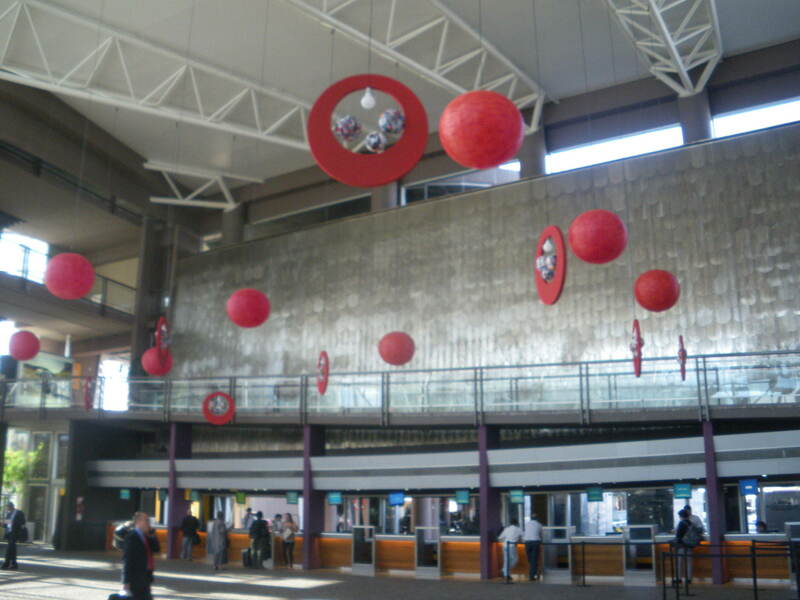 On my trip I was heading directly to Puerto Iguazu as I had seen Buenos Aires before, so I simply walked along Avenida Antartida Argentina to the large Retiro Bus Station (where I had already booked my overnight Crucero Norte bus to Puerto Iguazu. That walk took around 20 minutes. 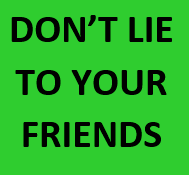 If you want to do the same route as me and have any questions please leave a comment below. World borders is a regular feature on Don’t Stop Living and crossing borders is a part of travel that I just love! 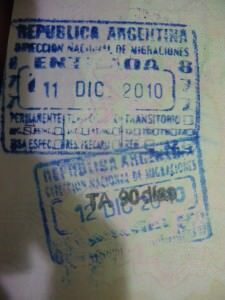 This entry was posted in Argentina, Buenos Aires, Buses, Colonia Del Sacramento, Destinations, Ferries, Montevideo, South America, Uruguay, World Borders. Bookmark the permalink.